This archive holds all posts form April 27, 2009. 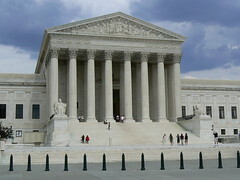 Coming in June 2009 is a Supreme Court decision that is likely to rule, once again, against affirmative action. The case involves white firefighters in New Haven, Connecticut. The city had a conventional (the NY Times says, poorly contstructed) promotion exam on which in 2003 white test takers did better than black or Latino test takers. The city invalidated test results as discriminatory against candidates of color. White firefighters sued, arguing they were discriminated against. The issue of “reverse discrimination” and “reverse racism,” clever white reframing terms, was again raised, with these oxymoronic phrases being widely circulated. The United States Court of Appeals for the Second Circuit in New York, and the trial court before it, ruled that the city had acted properly. Title VII of the Civil Rights Act of 1964 requires employers to ensure that employment practices are not racially discriminatory. Because New Haven had a reasonable belief that the test discriminated against minority applicants, it had a legitimate basis for discarding the results. If the Fire Department had promoted based on the test, two Hispanics and no blacks would have been eligible for the seven open captain positions. No Hispanics or blacks would have been eligible for the eight lieutenant positions. Faced with a test that had such a strong adverse impact on minority applicants, New Haven decided to throw out the results and leave the supervisory positions open. In their lawsuit, the white firefighters insist that there was nothing wrong with the exam. It’s hardly the first time the Supreme Court has ruled on race related employment and education cases. In each instance the rulings have done much to fuel the notion that a majority of Americans oppose affirmative action. The other pillar of the Supreme Court’s anti-affirmative argument – and it cropped up again in the New Haven case – is that qualified white males are getting kicked to the curb and are losing ground to unqualified blacks, minorities and women. . . . According to census figures, if every unemployed black worker in the country were to displace a white worker, only a tiny fraction of whites would be affected. Furthermore, affirmative action pertains only to job-qualified applicants, so the actual percentage of affected whites would be minuscule. In New Haven, the number of firefighters allegedly affected was 20. The main sources of job loss among white workers have to do with factory relocations and labor contracting outside the United States, computerization and automation, and corporate downsizing. I have mulled over these thorny issues in several places before, and let me summarize some general thoughts about racial discrimination and its affirmative action remedies. First we need to consider where most racial discrimination has occurred in this society. Discrimination, as conceptualized by most scholars of racial-ethnic relations, emphasizes the dominant group–subordinate group context. Racial discrimination usually refers to actions of members of dominant groups—for example, white Americans—taken to harm members of subordinate groups, such as black, Latino, Asian, or Native Americans. Historically and today, systemic white discrimination is not just a matter of occasional white bigotry but involves the dominant white group’s power to enforce its racist prejudices and framing in discriminatory practices across many institutions. On occasion, individual members of subordinated racial groups can be motivated by their prejudices to take action to harm those in the dominant white group. Yet, with modest exceptions, members of racially subordinate groups usually do not have the power or institutional position to express their stereotypes and prejudices they hold about whites in the form of continuing and thus substantial everyday discrimination. Think about the historical and contemporary US patterns of racial discrimination directed by large numbers of whites against just one major group, black Americans. That mistreatment has meant, and still means, widespread blatant and subtle discrimination by whites against blacks in most organizations in all major institutions in U.S. society—in housing, employment, business, education, health services, and the legal system. Over four centuries, many millions of whites have participated directly in discrimination against many millions of African Americans. Judging from opinion polls and research studies, a majority of whites currently still hold numerous negative stereotypes of African Americans and millions of these will discriminate under some circumstances. And most whites observe anti-black discrimination around them without actively working to stop it. This widespread and systemic discrimination has brought extraordinarily heavy social and economic losses (the latter estimated to be trillions of dollars over nearly 400 years) for African Americans in many institutional sectors of society. What would the reverse of this centuries-old anti-black discrimination and other oppression look like? The reverse of the institutionalized discrimination by whites against blacks would mean reversing the power and resource inequalities for several hundred years. In the past and today, most organizations in major institutional areas such as housing, education, and employment would be run at the top and middle-levels by a disproportionate number of powerful black managers and officials. These powerful black officials would have aimed much racial discrimination at whites, including many years of slavery and legal segregation. Millions of whites would have suffered—and still suffer—trillions in economic losses such as lower wages, as well as high rates of unemployment and political disenfranchisement, widespread housing segregation, inferior school facilities, and violent lynchings. That societal condition would be something one could reasonably call a condition that significantly “reversed the discrimination” against African Americans. What is usually termed reverse discrimination is something much different from this fictional anti-white scenario. The usual reference is to affirmative action programs that, for a limited time or in certain places, have used racial screening criteria to overcome a small part of past and present discrimination that targets racially oppressed people. Whatever modest costs a few years of affirmative action have meant for whites (usually white men, for white women have been major beneficiaries of affirmative action), those costs do not add up to anything close to the total cost that inverting the historical and contemporary patterns of discrimination against people of color would involve. Affirmative action plans, as currently set up—and there are now far fewer effective plans than most critics suggest—do not make concrete and devastating a widespread anti-white prejudice or framing on the part of people of color. As implemented, affirmative action plans have mostly involved modest remedial efforts (typically designed by white men!) to bring token-to-modest numbers of people of color and white women into certain areas of our economic, social, and political institutions where they have historically been excluded. If remedies for racial oppression, such as serious affirmative action, are real and successful, they will of course mean some costs to be paid by those who have benefited most from centuries of racial and gender discrimination. Yet, today, a white man who suffers as an individual from remedial programs such as usually modest affirmative action in employment or education suffers in but one area of life (and often only once) and because he is an exception to his privileged racial group. A person of color who suffers from racial discrimination usually suffers in all areas of her or his life and primarily because the whole group has been and still is subordinated, not because he or she is an exception. In spite of continuing high levels of discrimination targeting Americans of color, over recent decades, most remedy programs have been weakened or phased out as a more conservative white perspective has regained full control in most major public and private institutions. Today, this retrenchment from racial desegregation of U.S. society is quite substantial, and it resembles the white reactionary backtracking in the 19th century that took place after the Reconstruction era. After Reconstruction the white elite replaced slavery with the near-slavery of legal segregation, much to the longterm detriment of the entire society. Are we in a new post-Reconstruction period, in spite of a electing a black president?